Back in the old days, the savvy traveler got to the airport early for his AirTran flight, knowing that there were no reserved seats and those first in line would enjoy more legroom, a view, or at least not wind up stuck by the lavatory. Today, AirTran allows passengers to pick their seats at the time of booking. Unfortunately, the airline is also charging for the privilege. AirTran charges $5 each way to make a normal coach seat reservation, or $15 for an exit-row seat. 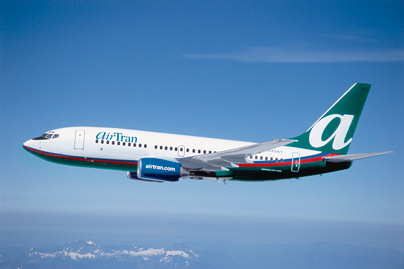 According to an article in the Atlanta Journal-Constitution, AirTran’s frequent flyers were notified of the new charges, though the airline did not put out a press release on the subject. This makes AirTran the first low-cost airline I know of that’s charging for seat reservations. But last year, Northwest began its own Coach Choice program, then wisely modified it so that at least its elite members wouldn’t be hit with $15 fees for booking a more coveted seat. Apparently, Southwest is also considering such a fee. To be fair, AirTran has at least added the possibility of reserving a seat, which is a convenience that was previously lacking. On the other hand, it’s another instance of industry nickel-and-diming, since I’d predict most of us won’t be willing to risk getting stuck with one of the few remaining (likely middle) seats after all the best ones have been snapped up. The list of people who might want to choose their seat is long, from those who are tall to anyone traveling with a companion.